Surviving in the harsh environment of numerous competitors can be tough for an online store. But you’re in the business to grow and prosper, not just survive, right? Therefore, it’s important to have some “secret weapon” against mediocrity to stand out of the crowd and move forward with your business. First of all, according to Bain study, increasing customer retention by 5% can grow company profits by 25 to 95%. Secondly, Marketing Metrics book states that a return customer is 60-70% more likely to convert than the new one. Third, Adobe research has shown that 40% of an online store profit is brought by 8% of its loyal customers. Finally, numerous studies have proved that the cost of retaining an existing customer is about 10% of the cost needed to acquire a new one. So, now you know that loyal customers are one of your most valuable “assets”, but how do you make a first-time client want to buy from your e-shop again? It’s not that easy, given the amount of competitors with similar product range. It turns out, selling items at a moderate price and maintaining good level of customer service might be not enough - because it does not differentiate you from others actually. Therefore, many successful businesses have tried to go beyond the traditional understanding of what their customers need and value, attempting to exceed their expectations. 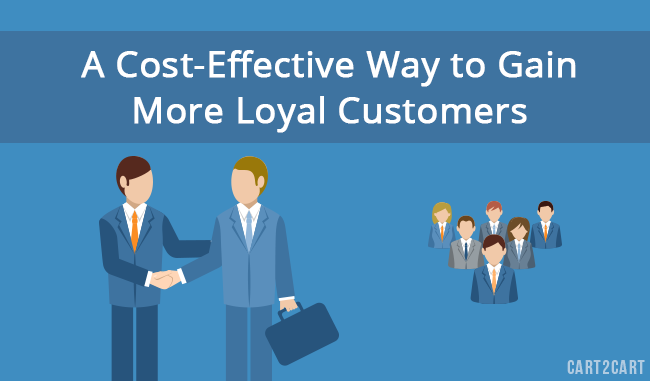 In most cases, it costs little and brings great benefits to the business. As a proof, try to recall your own experience of buying on the web that impressed you. In all probability, it was something quite trifle, but invoking positive emotions and making you want to share the news with friends, like a small candy found in a package with your order. While there are some basic things every person expects when purchasing online, like easy ordering, polite managers, timely shipping, and clear refunds policy, there might be some things specific to your target audience or products on sale. To find them out, you can try asking your customers for feedback, sending short email questionnaires, inviting to join the discussion in social networks etc. The feedback you receive can point out the concealed problems that prevent some of your visitors from converting or buyers from returning. So, deal with those first. In case you’ve already perfected the service, you can work out a strategy of retaining and surprising your customers. How to exceed customer expectations? For a start, you will need to do some brainstorming. Segment the process of a customer’s interaction with your store from the moment he/she learns about it and to receiving the package with the order. As an example, think about all possible steps before the purchase (finding the website, reading product descriptions, making phone or email enquiries etc), during the purchase (adding to cart, checkout), and after the purchase (order confirmation, shipping notice, receiving the purchase, post-purchase email etc). Pick the point you want to improve and go beyond the expected. There’s no sense in dispersing your efforts in all directions - that’s counterproductive. Instead, work on one point at a time, gradually moving further. Go ahead and turn your idea into reality! But make sure you measure the result by asking for feedback from your customers and using analytics data to see any positive changes. maximally personalizing interaction with customers by gathering and systematizing data about their orders, preferences, family members etc. complementing the first purchase with a discount card. presenting some bonuses or discounts for specific items with the second and next orders. things that come up to your mind. greeting each customer on their birthday with a hand-written birthday card (maybe + some gift). While all of these things cost little or even nothing in terms of finances, they can bring you good raise in profit. Other than that, and more importantly, they help to build trust and a long-lasting relationship with customers, making them choose your store over others each time. Moreover, they would be tempted to share the positive emotions you presented them with, thus extending the circle of your potential new buyers through word-of-mouth. Finally, bringing joy to others will make your more emotionally rewarding and give colour to the routine tasks. Do you already over-deliver on some points mentioned in the text or would like to share your ideas on the topic? We will be happy to hear from you, so join the discussion below!